Luverne “Vernie” Elizabeth (Wylie) McMillen died peacefully in Gallatin, TN on January 19th at the age of 90. Vernie was a leap year baby born in 1928, in Lake Park, Minnesota. She always celebrated her birthday on the 28th of February and enjoyed claiming she was years younger by using the multiplier to her advantage, like in dog years. As a very young girl, Luverne entertained audiences and tap danced over the radio and at special events. She got the nick-name, Shirley Temple because of her beautiful golden curls and her animated smile and talent. For a period of time, she played the drums in the school marching band. In later years, Luverne marched in parades as lead majorette for Frazee High School in Minnesota and performed in front of the King and Queen and other dignitaries twirling her baton. 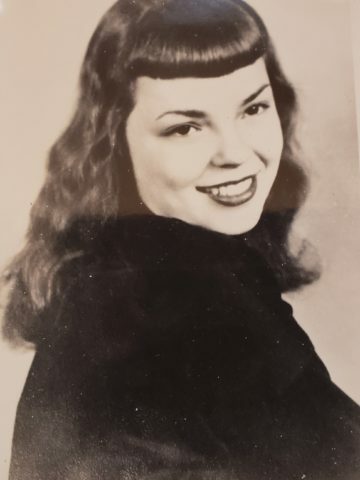 After graduating high school in 1946, she had dreams of directing radio or stage plays and attended the University of Iowa to study theatre. She performed in several productions and learned how to overcome stage fright. It was there that she met the love of her life, Leonard R. McMillen. He had returned from serving in the Army during WWII and attended the University on the GI Bill. They were married June 7, 1947 in Elkader, Iowa at an intimate ceremony held in the beautiful gardens of an asylum. Following the ceremony, they relocated to Miami, Florida so Len could attend law school at the University of Miami. Vernie sacrificed her goals and career and worked at the Florida Power and Light Company to put her husband through law school. While there, she was a pioneer for equal pay for women. In 1957, Luverne and Leonard adopted a 17-month-old little girl and named her Devra. She would be their only child. The couple lived in Miami until Len retired in 1987 and moved to Ft. Myers, Florida. They enjoyed 43 years of marriage together when she lost her husband to lung cancer. Luverne captivated everyone with her infectious, positive outlook on life and never met a stranger. She had a huge heart that was compassionate and giving. She loved reading, history, politics, cooking, travel, movies, art, architecture, the symphony, animals, and swimming. She was a volunteer for the American Cancer Society and a breast cancer survivor. In 2009, Luverne moved to Nashville, Tennessee to be closer to her daughter, grandchildren and great-grandchildren. As she continues her journey, she will be deeply missed, but never forgotten. She was preceded in death by her husband, Leonard Robert McMillen; brother, John Mac Wylie; parents; John Wesley Wylie, Maude Marion (McGhee) Wylie; sister, Edna Mae (Wylie) Courneya; brother-in-law, Clifford Medrick Courneya. Luverne is survived by her daughter, Devra McMillen, Hendersonville, TN; her three grandchildren; Melissa (William), Springfield, TN; Kimberly (John), White House, TN; Matthew (Kiera), Pulaski, TN; eleven great-grandchildren; Kaleigh; Awstyn; Zachary; Lexionna, Dylan, Breonna, Ashlyn, William, Haily, Aynsley, Gauge; nieces and nephews; Terry (Terry); John (Linda); Richard; Robert (Mary); Patrick (Michelle); Mark; Daniel (Sandy); and Mary (Mark). Arrangements by Hendersonville Memory Gardens, Funeral Home and Cremation Center. In lieu of flowers send donations to the Alzheimer’s Association or the American Cancer Society. The family would like to thank the caregivers at Cadence of Rivergate, Gallatin Health Care and Asera Care Hospice for their compassionate dedication.